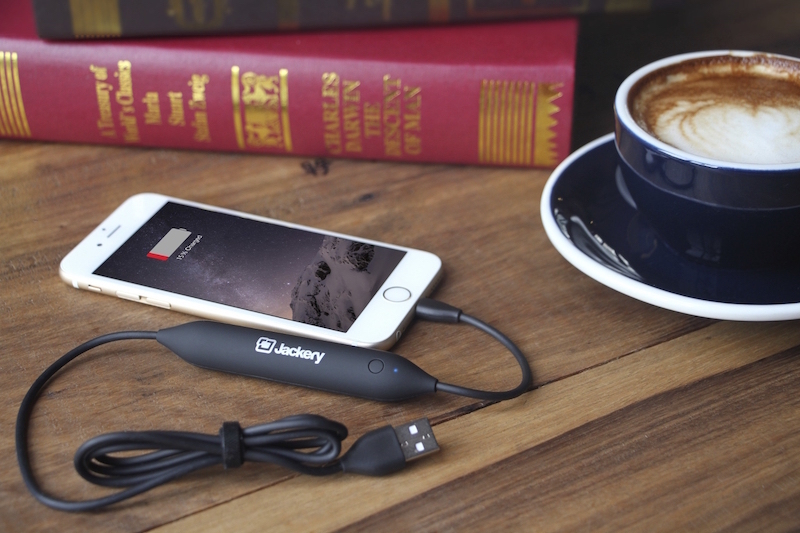 Jackery has introduced the Jewel, claimed to be the first-ever Apple-certified Lightning-to-USB cable with a built-in battery for iPhone, iPad, and iPod models. The 3.2-foot cable features an integrated 450mAh battery that can, for example, fast charge an iPhone 6s up to 26% or an iPhone 6s Plus up to 16%. Like any other Lightning cable, the Jewel can provide a 1 amp charge from any USB power outlet or transfer data from the iPhone, iPad, or iPod to a connected Mac or PC. A built-in LED on the battery and charger case gives users information on battery levels. In charging mode, an LED flashes and illuminates in red, green or blue to indicate levels, and users can also push the cable's power button to check battery levels. The LED also indicates levels in recharging mode and will continue flashing until the battery is fully charged. The cable is available now for $19.99 from Jackery or Amazon in the United States. The cable is coming soon to Canada and the United Kingdom. Update: As several readers have pointed out, Native Union also offers an MFi-certified JUMP Cable with integrated 800 mAh battery for $50. At first I thought it was dumb but now that I think about it it's actually pretty clever. It's a lot more compact and simple than having a battery pack + a charger for your iPhone + a charger for your battery pack. Fits nicely in a jacket or small backpack compartment. When it comes to charging through USB, you just plug a single cable and it charges both the integrated battery and your iPhone's battery. Pretty elegant. The main downside is that 450mAh is small, but given that this is very compact and just $20, it's still cool as an "emergency" battery when you really have that important phone call to make / info to look up but your phone is dead. It's a neat bonus for roughly the same price as Apple's regular Lightning cable. I can't help but think that all these integrated batteries in everything is just exponentially increasing our e-waste. True. Apple should include in their environmental report the impact of battery waste from the accessory market due to their refusal to put higher capacity batteries in the iPhone. This should especially be the case if, after that new battery tech enters the market that doubles capacity, they end up making the iPhone really thin instead. I like this product, not something i would probably buy/need personally though. I've got one very similar to this: https://www.amazon.co.uk/dp/B00WOPNE0W. Even more compact as it fits in middle of my Bellroy ('http://bellroy.com/products/slim-sleeve-wallet/eucalyptus')wallet. Great for them days when I'm out late into the night, or out in the sticks with no power sockets. It has a micro-usb cable built in (handy for friends vapes or Android phones) and a little Lightning adaptor for iOS devices. It's a brilliant little product the size of about 7 or 8 credit cards stacked. 2500 mAh. Plus as it's flat you can hold the charger against the back of the phone whilst it is charging and continue to use it without dangling wires. iPhone 7 users will of course need a second one for their headphones.